Help ALF achieve lasting results in the preservation of our nation’s lighthouses! From restoration projects to visitor experiences… Your support is critical to ensuring our success in protecting these icons for future generations to enjoy and learn from. 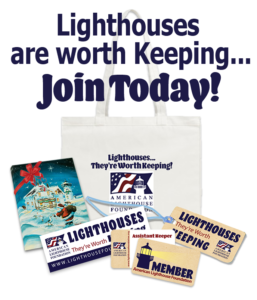 Commissioner Members $250 or more: Member benefits plus Luggage Tags, Tote Bag and 14 notecard set (2 each of 7 ALF lights) featuring the Christmas Lighthouse artwork of artist Virginia Souza. The best benefit is knowing that you are a modern “Keeper of the Lights” and part of a group of people ensuring these historic structures are saved, maintained and accessible for both present and future generations to appreciate and experience!